We never set out to do a Goseiger re-release. It just sort of… happened. While KouAidou was translating Zyuranger, she was also retranslating certain episodes of Goseiger. She never expected to release them, or fully retranslate the show, because she thought nobody would really be interested. Except I was. I LOVE Goseiger, I really do. I got into Super Sentai right about the time when Goseiger started airing so, naturally, I wanted to watch the currently airing show while I was watching Zyuranger. At first, I was incredibly disappointed. I hated this show a lot. Nothing clicked with me besides the amazing opening song. But I kept watching and sometime around episode 8 or 9 I really got into it. Subbing the second Sentai I ever saw while subbing the first Sentai I ever saw was pure coincidence, but an awesome one nonetheless. We even decided to create our own group for this, and for our other future projects. Unlike Zyu where we released an episode or two weekly, we’ve decided that with Gosei we’re going to do it by arcs. A little change of pace never hurt. There’s a lot of things in Gosei that make it enjoyable, at least to me. I really love the stuntwork in this show and I think the suit actors did a damn good job portraying the Goseigers. The monster designs are just great, and I really like a lot of them. Not just the important villains (Drekk’s suit is awesome though) but the regular monsters of the week too. You’ll notice that most of the monsters in this show have actual moving mouths. That might not seem like a big deal but, a lot of Sentai shows don’t have something so basic in their monster suits and I think it makes Gosei’s suits stand apart. Another great thing is the mecha fights which IMO are just fantastic. There’s a lot of little details in the model city (Like in the movie where there’s a tiny BandaiNamco sign on a building) and you can even see model cars and sometimes the inside of buildings. The set designers just went all out when it came to the robot battles. Even the camera angles are different from other Sentai. While Gosei is no different than any other post 2000 show in that it likes to spam CGI whenever it can, it also uses a lot of practical effects. Episode 2 has a great mecha scene that is mostly made up of actual models. GoseiGreat’s Victory Strike attack is an actual prop sword that they lit on fire. It’s real fire! No CG! And we all know how much Toei loves its CGI fire. Practical effects are on of the reasons I love Toku so much. I really think that Gosei does a lot of different things than most Sentai that came both before and after. It’s a really unique show. It does have its bumpy parts though but hey, Nobody’s Perfect. The fandom’s current opinion on Gosei isn’t all that positive (neither was their opinion on Zyu until a little more than half a year ago), but don’t let that influence you! Give it a chance (or for some of you, another chance). If you hate it, then at least you tried it and that’s all I ask. If you like it, then congrats! If you’ve seen it before, or even just finished it (I’ve seen those posts on 4chan) then consider giving it a rewatch. It might just change your opinion. Also, to those of you who are sitting at your computers all pissed off right now because we decided to do this and not an unsubbed show well, I want you to take a look at our group name and think Mega hard about where we got that name from. Epic 2: Dat mecha sequence! Epic 3: Dat snow fight! Epic 8: Everything. Just everything. Epic 9: As a male, this episode makes me feel really uncomfortable. Also, ULTIMATE DINOSAUR TRICK! Epic 11: G-O-S-E-I! G-E-R! 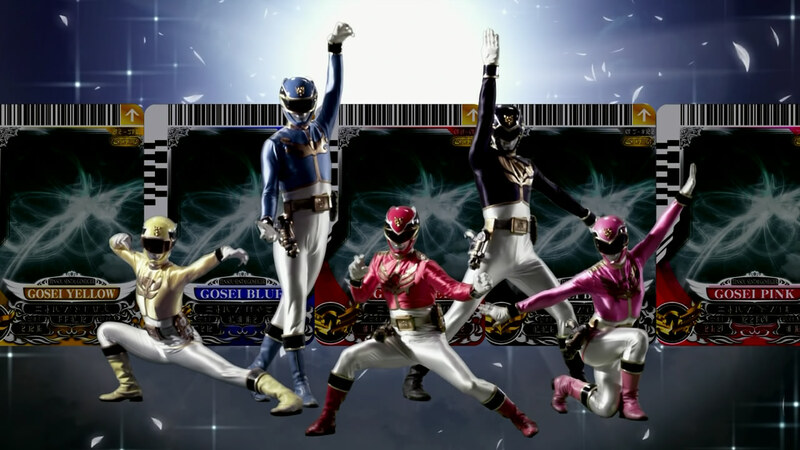 GOSEIGER FIGHT! Epic 14: Doggie Kruger as a monster who’s named after Stargate. Epic 16: Alata. Total badass. Translating a show weekly, as it comes out, is a very different process than working on a show that is already complete. When translating a show weekly, there is an extent to which even the best possible staff will be flying by the seat of their pants, and making educated guesses about anything that isn’t obvious. In most shows, this will turn out fine. Goseiger, though, had a major writing feature that even Japanese fans didn’t figure out until the show had been on the air for about two months. Prior English translations do not take this aspect of the writing into account, and honestly probably couldn’t without changing translation style mid-stream. Every episode of Goseiger is a reference to a movie. Each monster of the week is based on a movie, as are all of the recurring villains. About nine times out of ten, that movie is a pretty famous Hollywood movie, though it might be one that got weirdly retitled for its Japanese release. Generally, every monster does something or has an ability that directly references what happened in the film it’s based on. Some of the references are subtle and require having seen the film to figure out. Others are pretty blatant and simplistic. A handful are forced, at best. Usually, the monster’s name is based on a film’s Japanese name. To make the movie references easier to spot, we’ve translated the monster names so they reference English titles, in cases where they are different. Most of these names are fairly obvious if you’re familiar with the film in question. Since Goseiger references a number of older films, though, we’ve decided to construct a “cheat sheet” that outlines all of the basic information about each monster, the movie it references, and how the reference appears in the show. We also threw in some entirely unnecessary extra stuff that we thought might be funny or interesting to someone. You should have no problem understanding what goes on in Goseiger without keeping track of every single movie reference outlined in the cheat sheet. That said, knowing the movie references can add an extra layer to the show’s better episodes, and can help make clear what the not-so-good episodes were probably supposed to be about. The cheat sheet is really just there so you can figure out a bit more about where the show’s writers were coming from. For this particular story arc of Goseiger, the Warstar arc, all of the monsters are based on sci-fi films that embody the themes “space exploration” and “otherworldly visitors.” This is meant to fit in with the idea of the Warstar as a take on the “alien invader” type of Sentai villain. Future arcs will also use monsters based on different types of films, though broadly the series sticks to effects-heavy genre films of various sorts. The monsters, the B.B.s, are based on the general concept of “B movies.” Most of the films referenced in Goseiger could be broadly viewed as B movies, though there’s a few obvious exceptions. Will the movie references change your opinion of Goseiger? Probably not, honestly. But if you did like something about the original show, you may find knowing a bit more enhances your enjoyment. If you haven’t seen the show at all yet, or if you want to see how it’s different from Megaforce, then we hope the extra info adds something to the experience.